Fitness crazes have a knack of starting in California. With wall to wall sunshine, everyday folk have a solid incentive to be in shape for much of the year. Add in Holywood, and you have a fitness hotbed, where appearance can often come ahead of substance. It’s in this appearance driven world that Fitwall are looking to start a fitness revolution. 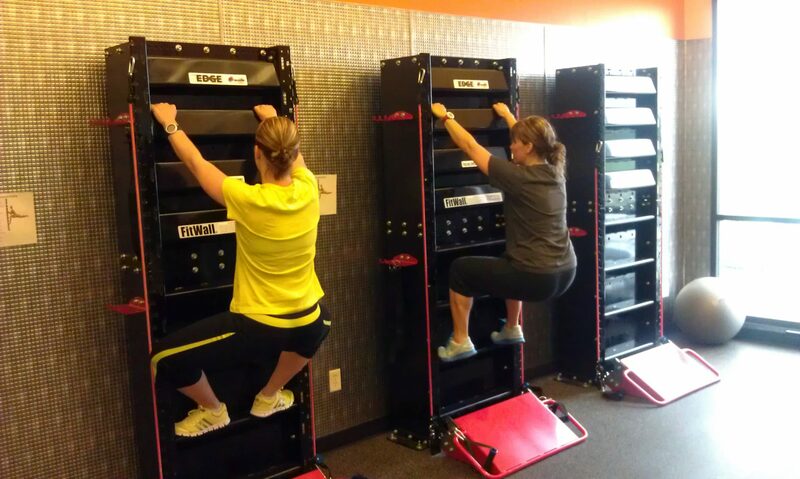 Fitwall is the alliance of one of the most effective cardio workouts – climbing – and high end fitness technology. The concept is quite simple, marry a high end fitness studio with heart rate monitors and accompanying smartphone and tablet apps to track your progress in real-time. The company is headed up by fitness entrepreneur Josh Weinstein and three business partners, Doug Brendle, Ethan Penner and Anthony Westreich. The partners plan for their Californian debut to be the first of 100 such facilities, spread across the USA. With Holywood royalty in mind, their first studio is designed to look more like a smart shopping centre as opposed to a gym. The partners know that a venture in La Jolla, Calf, will be judged by its appearance first, and their fitness centre doesn’t disappoint. To reinforce the tech theme of Fitwall, members will check in using iPad’s in the lounge-like reception. The gym experience is entirely focussed around the Fitwall device. It essentially appears to be little more than an empty rack or even a bare cupboard. It certainly appears to be something more akin to a crossfit studio as opposed to a conventional gym. However, where Crossfit focusses on merging Olympic lifts, with bodyweight moves and strongman-style cardio work, the Fitwall experience is focussed entirely around this empty cupboard. This empty cupboard is actually a “vertical training modality”. It stands at 7 feet tall and is 30 inches wide. It has four stationary rungs which are used for foot placement and four grips which are used to perform a range of exercises. The unit has an iPad attached, which shows key performance factors like your heart rate, intensity and anticipated calorie burn, all updating as you train. The moves that you perform on the device are reincarnations of old classics, such as pull-ups, squats and leg extensions. In total, the company claim over 900 exercises can be performed. Fitwall is not available to buy at the moment, but has an estimated price of $2500 – $5000 per unit, with the price differing due to the quality of steel and components used. Besides the Californian studio, the only other place where you’ll find Fitwall is in select celebrity gyms and at certain private gyms used by NFL stars. Gym sessions at the Fitwall studio will come at a price that reflects this, starting at $120 per month. That gets you a mere 4 sessions, with eight sessions costing $220/month. In truth, Fitwall is not intended to be your only source of a workout. Its seen as a supplement for crossfit and yoga, and is as such looking to hit those markets.